Drexel University is known for its hands-on learning like the infamous co-op, endless research and study abroad endeavors and community-based learning courses, so it’s not surprising that Drexel finance students are getting the opportunity to manage millions of dollars in stocks. Managed by LeBow College of Business undergraduates through two courses, Applied and Advanced Portfolio Management, the Dragon Fund has given students access to industry experts and networking opportunities since 2007 when it was started by a $250,000 endowment. 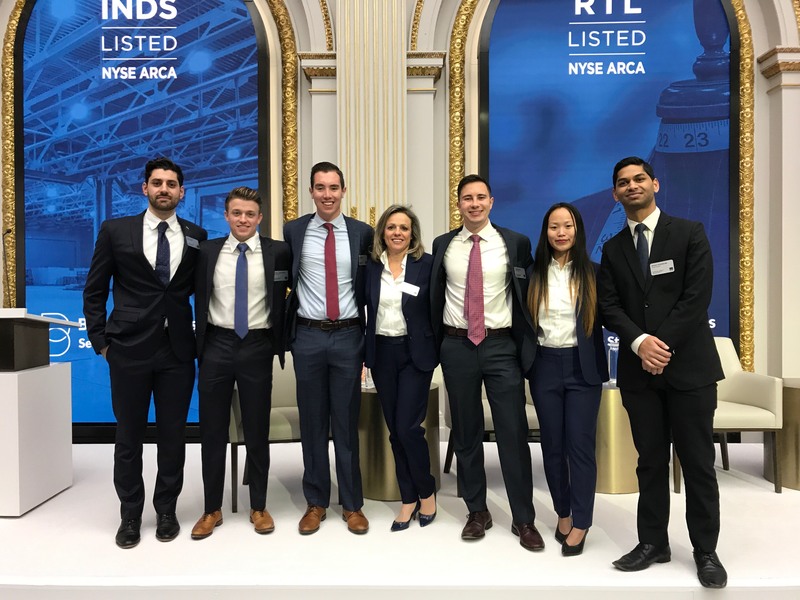 But this quarter, students running the equity portfolio, which now is worth more than $2.2 million, got to pitch stocks at a symposium held at the New York Stock Exchange. “Getting to go the NYSE was a once in a lifetime moment for us,” finance major Max Goldstein said. This opportunity, like many others available to students involved in the fund, offered students real-world experience, which is what finance senior Dean Blank said the Dragon Fund is all about. “It really opens up the doors for Drexel students in finance,” he said. But this event, which was hosted by Benchmark Investments, has been one of the biggest doors it has opened for the students, who had to apply to become a part of the official team. During the symposium, Blank, Goldstein and a team of four other students joined a discussion on new ideas in the industry — mostly focusing on technological advancements — in front of a crowd of several hundred Wall Street experts, while it was also live streamed to an even wider audience. “It felt great to speak in front of so many industry professionals. I have always enjoyed public speaking and this was the greatest public speaking opportunity that I have ever had,” Goldstein said. Rachel Bliss, a finance student who transferred to Drexel, said it was a uniquely special opportunity that she still can’t believe she experienced. The team also pitched two companies related to technology during the forum. The stocks they pitched included Global Payments, a payment processor, and Proofpoint, a cyber security stock. Both have performed well, Blank said, noting that Proofpoint in particular has experienced an impressive revenue increase since the team first invested in it. “We bought it in December and in the past month, it’s had about 44 percent return already. That’s about 15,000 return in a month, which is good,” he explained. But the fund, which specializes in U.S. midcap stocks, has shares in a wide array of industries, according to Blank. “We’re a pretty diversified portfolio,” he said, explaining that it’s important to permeate varying sectors to protect against inevitable market volatility. Students in the courses do vast research on potential stocks that they share through thorough reports. At the end of the term, it is decided which stocks will be sold or bought based on a group consensus that is ultimately approved by the professor of the course. While Blank said that prior finance classes have taught students how to evaluate companies, these particular classes help students acquire a proficiency with financial software used by institutional investors, such as Bloomberg and FactSet, and they also get to work with senior investment professionals in collaboration with Drexel’s investment office as well as seasoned Drexel alumni. Dividing into prominent sectors, like technology, energy, materials and consumer staples, Blank said the students work top-down. “I think it’s really helpful how the class is structured that you kind of work from macro level and then go down to find where you see growth,” he said. And though students are divided by the different sectors of the economy, it is still a mutual undertaking. This, Blank said, results in a tight-knit group. “You’re all working together on the same team even though it’s different groups,” he said. “It’s work hard, play hard,” he added with a laugh. Bliss said the student team is the best part about being in the Dragon Fund, but though the group has fun, it’s not easy work. In addition to adjusting to a strong learning curve that results from inheriting a pre-existing portfolio with every group of students, Blank said there is a lot at stake since they are handling real money, which undoubtedly puts great pressure on the students. Bliss added that the financial modeling that is involved when choosing a stock is particularly hard to maneuver since there are a lot of factors involved in the valuation of stocks. But in the end, Blank said that there is no better experience. While he said co-ops are still highly advantageous for the field, they may not present as many challenges that are necessary for individual growth. “You don’t get an experience like this where you’re really challenged,” he said. Plus, students got to learn a lot of key takeaways about the real world of finance, Blank said. Most importantly, the group learned a lot about the presenting, which he said is especially important in finance. And overall, he said, he learned a lot about the hidden complexities of the perfect pitch. And for Bliss, she said that she learned the importance of being open to opportunities. Though she had second thoughts about the class at the beginning, it was all worth it in the end. And the learning doesn’t stop there. The class will also have the opportunity to pitch stocks at Philadelphia’s FS Investments within the next few weeks and they will also be taking a trip to Goldman Sachs in New York later in the term for the same purpose. This experience, Blank said, will be incredibly useful post-graduation as the students apply for jobs. Not only will they feel more comfortable pitching, but they will also know the ins and outs of the software programs — something that he said he is very thankful for. It was also a highlight for Goldstein, who said this has been his favorite course at Drexel. Disclaimer: Dean Blank is a former Business Manager of The Triangle.